I've been stalking all of you, bet you didn't know that. Sorry I haven't been commenting much, I have these adorable new accessories, bracelets if you would like to call them that on my wrists. I've had Carpal Tunnel for years but it's really aggravated at the moment. So if you see crazy comments on your blogs like mmmm, or hmmm - just smile and nod. Although, I am getting pretty adept at the two finger typing tango. What fun is a burger without some fries, or in this case some chips. I figured I needed to be a little bit good to make up for the Nutella Sweet Rolls I paraded in front of you the other day. I don't own a deep fryer, but all you need to make some chips is a heavy pot and a thermometer. Fill the pot about half way full with vegetable or canola oil and turn the heat on to medium-high until the oil reaches 350 degrees F. When you put in the potatoes the temp will drop and that's okay. I peeled four sweet potatoes and sliced them 1/8" thick using my mandoline, a knife will work just fine, just be sure and make them thin. Drop small amounts of the potatoes in the hot oil for a couple of minutes, remove and place the chips on a baking sheet with a couple of paper towels. While they were hot, I sprinkled them with a mixture of salt and a little bit of ground sage. Combine ground turkey, shallot, sage, salt and pepper in a large bowl and mix until combined. Divide meat into 4 - 6 oz. portions and place on hot grill. turn after 4 minutes and cook 4 minutes more. After the burgers are flipped place slices of pear on grill, flipping after a two minutes. A minute or two prior to the meat being finished cooking put cheese slices on top of burgers and let cheese melt. Then place your grilled pears on top of the warm cheese. Spread softened butter on buns and place on grill for a minute or two until edges start to brown. I must say these came out pretty tasty, the juicy turkey, the creamy cheese and the sweet pears were a really great combo. I promised Tina - Flourtrader I would share a photo of the projects that have been keeping me so busy, other than food. I found a chest at a local antique store and refinished it for my daughter's room. It was beige; I sanded it and gave it a gloss black finish with white pin striping. Not bad for $60 bucks, huh. Maybe I should mention this finish took 4 coats of paint, with sanding each coat in between, hmm, wonder why my wrists are aching. Last but not least, I'm sending a little love to Monet from Anecdotes and Apple Cores. I'm reposting the Baked Mostaccioli in a Skillet for Monet I made for her. Kate - Kate's Kitchen and Lizzy - That Skinny Chick Can Bake a.k.a. Lucky Lizzy were kind enough to assemble a book for Monet with this recipe and so many others and forward it to her. Thank you so much ladies for all your hard work it is truly appreciated. For now it's back to the pool side for me, while I nurse my wrists and my cocktail for a little longer. Gina, wow! I really don't know where my eyes should linger. I'm a bit hungry so the turkey burger is enticing me but I also want to hang around the chest because I'm so impressed that you transformed a $60 item into that gorgeous beauty. It goes so well with the teal and white walls. I love the combination. And that baked mostaciolli, yum! I'll have three kids with me for the weekend, so I've been trying to come up with ideas for tonight's dinner. Both your offerings here would be winners with the kids. Enjoy your day by the pool. We'll be doing the same! Hope the hands are back to normal soon! Oh my goodness that burger! I registered for a deep fryer I really really really hope I get it! ha I've been dieing for one! Knowing that I can make these chips without one though is very helpful :) And that pasta? I think I commented on it before but I need some.. I want some.. badly. WOW, Gina! You are SO gifted! What a fabulous dresser...in awe here. I'm sorry about your wrists...I get intermittent tendonitis so know your pain. The pool and a cocktail sound like the perfect way to heal. That burger is awesome!!! Man. what a delicious burger that must have been! I only eat turkey or chicken burgers and certainly would be a nice change for me. your bureau looks amazing, wow!! you are one talented woman! What a gorgeous looking burger huh? That is so interesting with the gouda and pear. I would never have thought to combine them. They certainly do seem to compliment each other well. That bureau! That is art! Pears on a turkey burger - what a wonderful combination. That dresser is amazing! Hope your wrists feel better, I am sure a poolside cocktail can't hurt! This all looks delicious. Those potato chips have my mouth watering! Hope you feel better soon. It's no wonder your wrists hurt! You've been really busy cooking, painting and refinishing. Go enjoy the pool! I'm craving meat today, and this burger is literally making my mouth water! Love the chips, though I've never moved into the frying area myself... someday. Nicely done, Gina! Good lucky with the hands... my husband can type almost as fast as I can with only 3 fingers! Not because he has an injury or anything, he just never learned to type! Your burger and those sweet potato chips look so good. I hope that your wrists feel better soon. Also, your daughters dresser is amazing. I am always in awe of people who can see what an old piece of furniture can become. 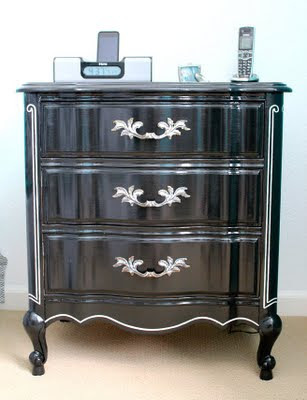 The dresser looks stunning with black finish. You certainly have done a great job! Take some rest and do eat a few more burgers! Now you made me want to try this pears and gouda. My favorite is smoked gouda. I should try the burgers or sandwich. I'm excited to try. And oh my...such a detail work (yeah maybe your wrists pain from 4 coats of paint with the same motion! haha). Really pretty...great job! And I like your daughter's teal color. It goes well with both black and white. We love turkey burgers and this gouda and pear combo has me running to the store to get the ingredients. You can also bake the sweet potato chips, if you need a healthier version. No wonder the wrists hurt! Wow - I'm in awe of your talent in paintwork, Gina. It's stunning. Stunning is also the word even on your burger: lovely touch with the pear and serving with the sweet potato chips. Love it! I had the first signs of carpel tunnel a few years ago and so I know how painful it is. Hope you recover from it very soon. Keep taking the cocktails! Cheers. Wow, that is some work you've done there. Refinishing furniture is a lot of work. Love fruit and cheese combo. Be good to yourself, lady! Yummy burger and chips! I want one and I want the cabana boy with the pina colada even more. :) What a perfect life! Sorry to hear about your wrists! You can 'hmmmmmm' all you want to save those creative-talented hands for recipes (and projects) like these :) Well done. Buzzed! I hope you get some rest on the pool!!! Oh I am so sorry to hear about your wrist. I had Carpal Tunnel years ago too, and just this past weekend I started suspecting it might be back because my right hand is going numb from time to time... Don't worry about the comments... With recipes like these, your readers will be coming back. What a gorgeous combination of flavors here... You had me at gouda and pear... Yummy! Thanks for sharing... Will say a prayer for your wrist! Hi Gina-if you ever decide to relocate to Palm Beach county, Florida...we are located in the middle of "Antique Rowe" ...what is literally called. These people need furniture re-finishers and they make tremendous amount of money to do projects like yours...from the $60 thrift price, this dresser could be sold realistically, for $600. (I'm not kidding)...Gorgeous dresser, and a great job! Gina, Ginaaaa...you know I love everything on this colorful plate, don't you? The turkey burgers, Gouda and those amazing sweet potato chips! Even with Carpal Tunnel syndrome, you're able to do all these extraordinary things like wall painting and refinishing that antique chest. Such a pro, and a dream mamma too! No wonder your CT is acting up! But the bureau looks fantastic, as does the teal/white paint job! You definitely need some relaxation pool side with a cocktail :) Pear and gouda are a match made in heaven - love how you incorporated them for the carnivores in your family :) Feel better soon! I am so sorry to hear about your Carpal Tunnel and hope you are feeling better very soon. And as for your projects, wow! That chest is so lovely, and I agree that I don't care for white paint usually but it looks wonderful against the teal. And thanks so much for the mention...Hugs! This burger looks fantastic! My mom and I are huge turkey burger fans and this one is definitely one to recreate over the next few weeks while I am home with her :) Hope your wrists are feeling better soon! Aww Gina I must have missed this while my computer has been sick for 2 weeks :( time flies!